I bought a bat display case several weeks ago and finally got around to hanging it yesterday. It holds five bats, and I've put my Morneau, Molitor, Mauer, Killebrew and Carew bats in it for now. 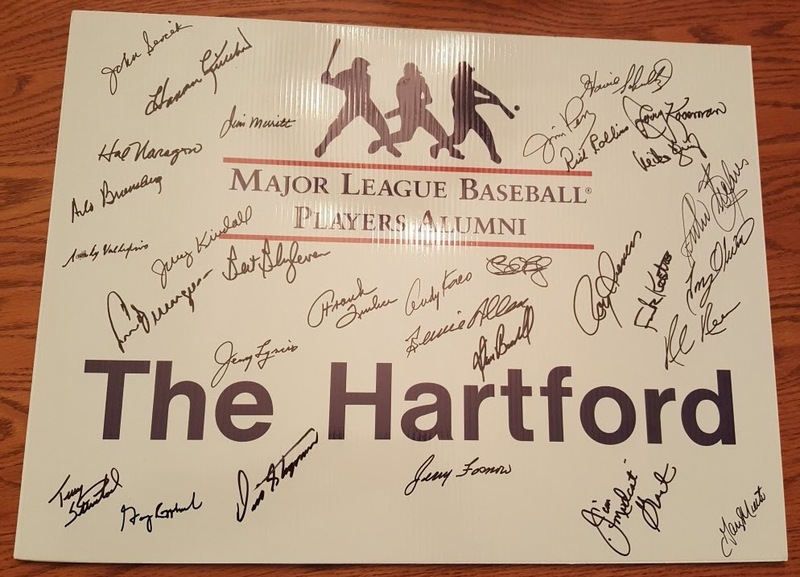 I may buy another case just like this one but I'm not sure where I'll be able to hang it. I had to take down my Mauer signed jersey to make room for this and still need to find another place for that as well. 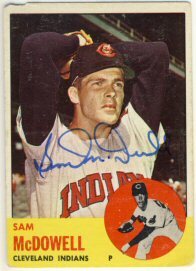 Still no ttm sent out or received, but I did receive a couple signed 1972 Topps that I bought on Ebay from Tom Orr at Atommic Sports. 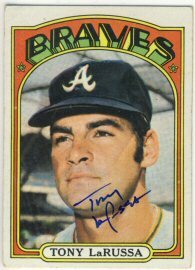 After scanning it in, I realized I already had the Tony La Russa card. I purchased it from Mickey's a while ago. The signature is quite different, so I looked on Ebay for certified examples and found that there are several different versions that all appear to be legit. 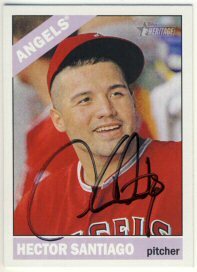 Anyway, this one is signed nicely. 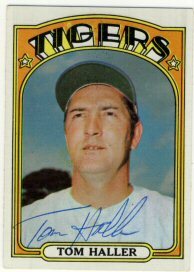 I also bought a card signed by Tom Haller, who passed away in 2004. 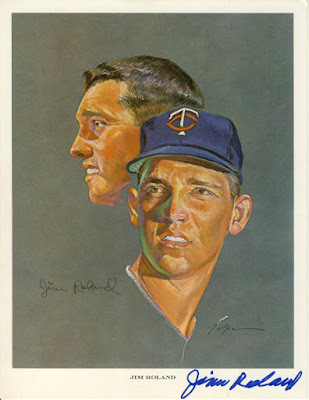 I've been working on the 1963 and 1964 Western Oil Nicholas Volpe Twins prints for several years. 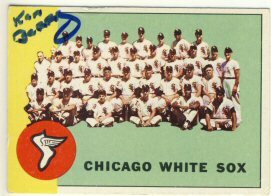 I've done much better on the 1963 set. 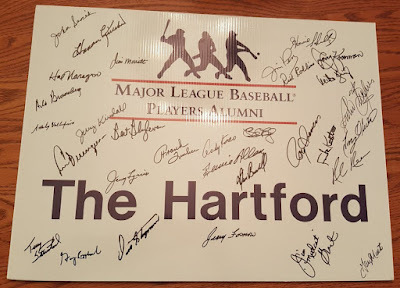 I was able to find a bunch of unsigned prints and get them signed ttm. 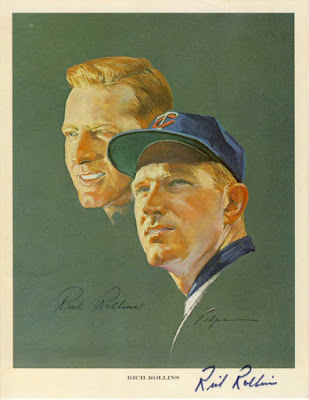 I have a harder time finding the 1964 prints, either signed or unsigned. When I saw fellow Twins fan Randy selling a few signed ones from the 1964 set I didn't hesitate to bid on them. 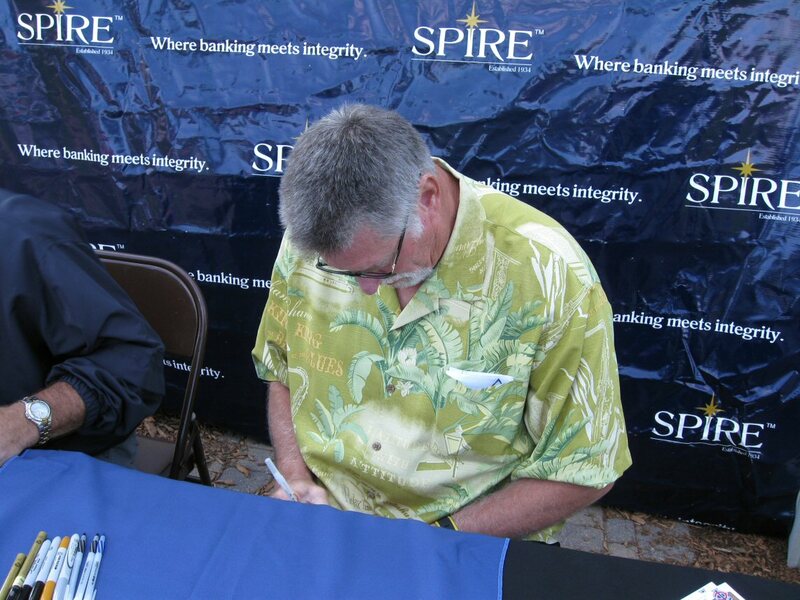 I prefer to have them signed within the picture as opposed to in the margin, but at this point I'm becoming less choosy. The Mincher one is perfect. Signed nicely in blue. 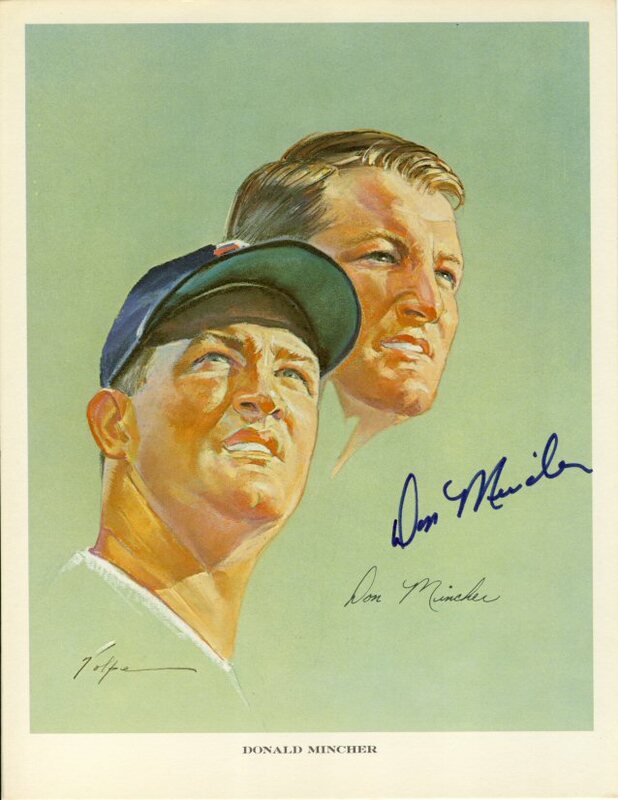 Mincher was a good signer ttm but passed away several years ago. 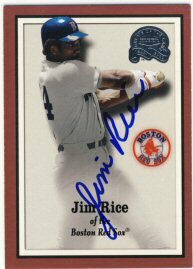 Rollins is a good signer ttm but I just haven't been able to come across any prints so I bought this one signed. 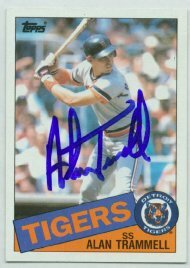 Roland is a spotty signer ttm, so again, I bought this since I can't find any unsigned copies to try to send ttm. 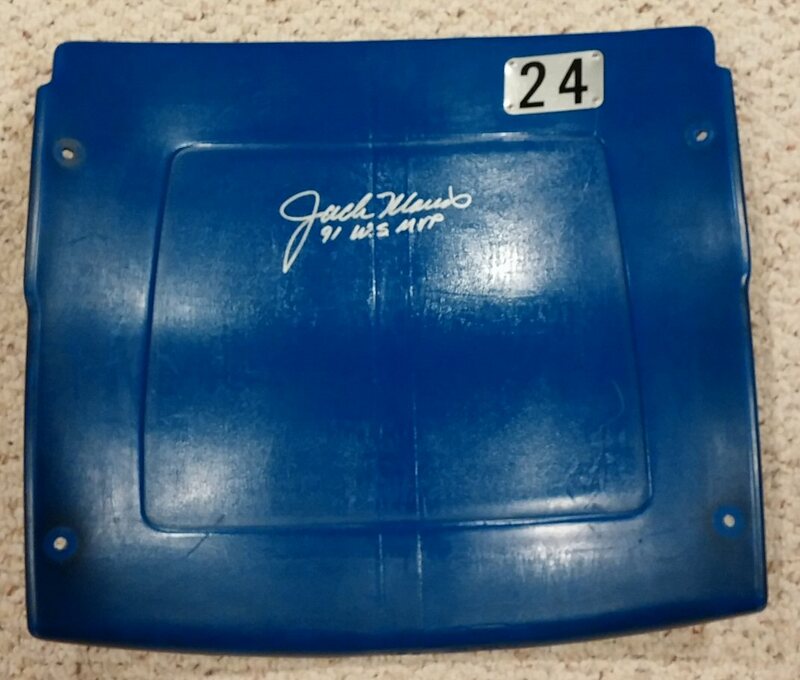 Check out Randy's other stuff at this link on Ebay. 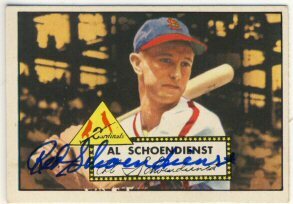 I haven't done any TTM requests but I did send in one card to an Atommic Sports signing with Red Schoendienst, who signed my 1952 Topps. 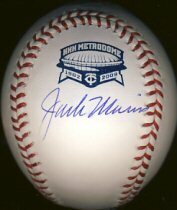 Who would have thought at the beginning of the year that the Twins would have a shot at the playoffs? The wildcard spot is theirs to lose. 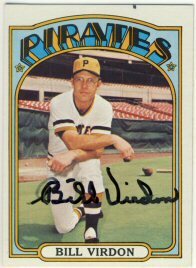 I suppose we'll win the wildcard spot and lose to the Yankees in the play-in game. 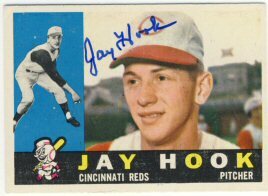 I have been very inactive in the hobby lately so I haven't had anything to post. 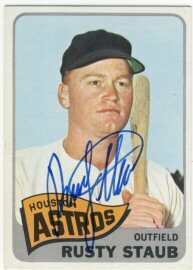 Last year, I sent in a couple of cards to a Rusty Staub signing via Atommic Sports. 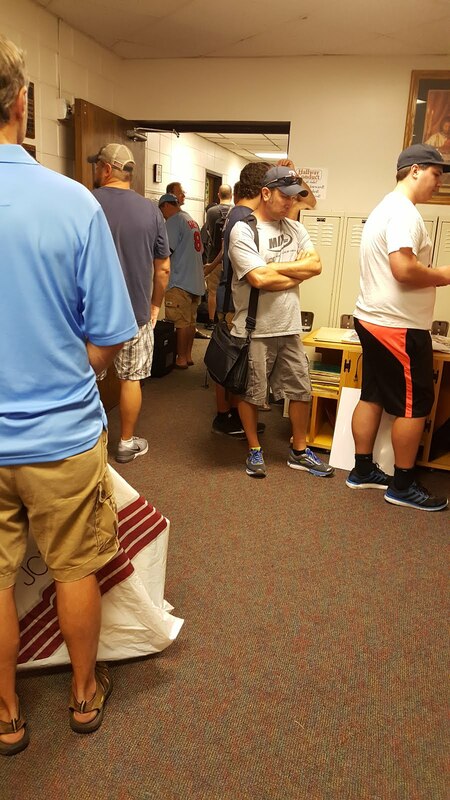 Unfortunately, Mr. Staub was unable to make the signing and the rescheduled signing just occurred. 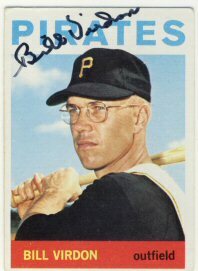 I had Mr. Staub sign his 1963 and 1965 Topps. 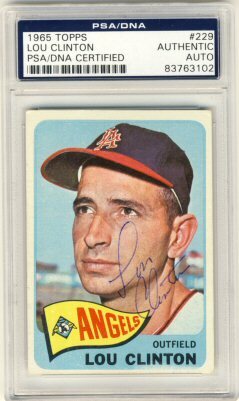 I"m still very short of my goals for the year, but this gets me a little closer to my 1965 set goal. 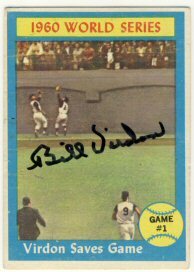 Today I received three cards signed by Bill Virdon, including a cool World Series card from the 1961 set commemorating his save in game one of the 1960 World Series. 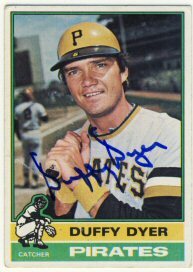 He also signed his 1964 and 1972 Topps for me. 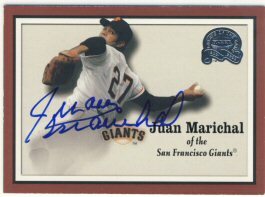 This is just the first 1972 Topps I've gotten signed this year although my goal is to get 10. I better get going on this! 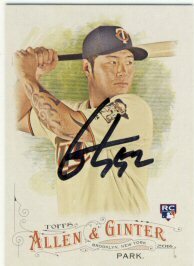 A few weeks ago I noticed some returns posted on SCN from Byung-Ho Park so I thought I'd send a couple cards. I've work casually on the Twins team sets from the Heritage and Allen & Ginter sets. 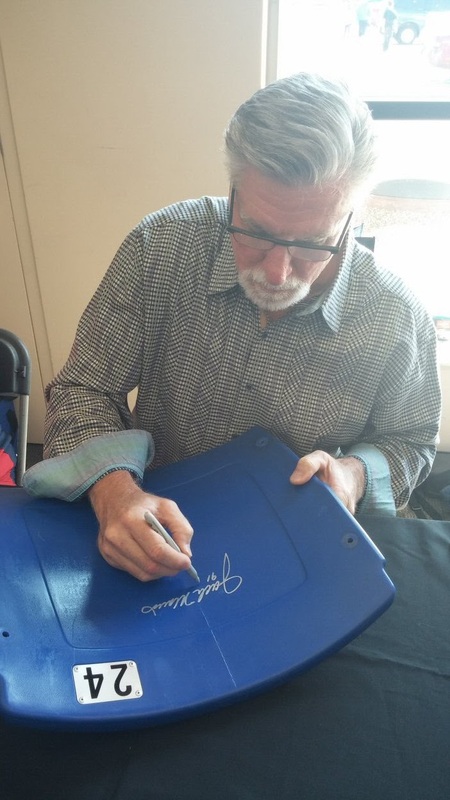 He was kind enough to sign a couple from last year for me via the Red Wings address. 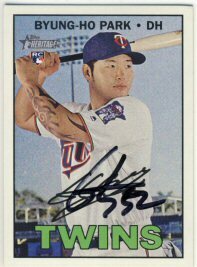 Unfortunately, Byung-Ho is no longer on the 40 man roster and isn't having a great season in AAA. 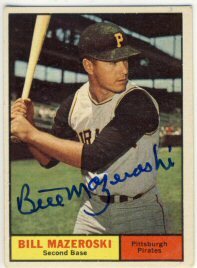 He's hitting only .223 with just 3 home runs. Hopefully he can turn things around. Okay, I just couldn't get over the fact that Mr. Robinson was signing through the mail for reasonable fees so I sent one more. 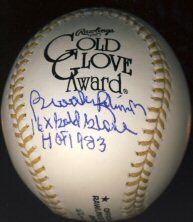 This time I sent a Gold Glove ball, which is signed on the side panel (as requested) and also included his GG and HOF inscriptions, which I didn't ask for. 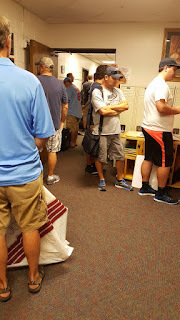 What a great surprise! It's been quite a while since I posted. I didn't post at all in May. I'm not sure if I've gone a whole calendar month without posting to this blog very often. I started sending out just a handful of requests. Mainly based on returns I've seen posted on SCN. 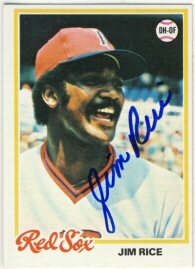 One example of that is Jim Rice, who is signing through the mail for $10 per card. 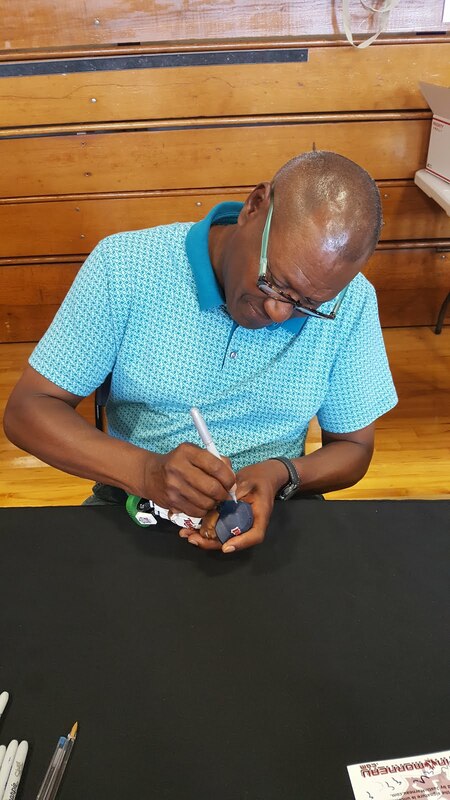 He signed his 1978 Topps and 2000 Fleer Greats of the Game in just 9 days. 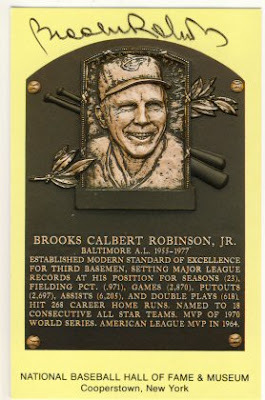 I'm happy to add another card to the Greats of the Game set without having to pay show prices. Neither of these cards help towards my goals for the year. I really need to get going on those goals! Yesterday I had two returns in the mail. 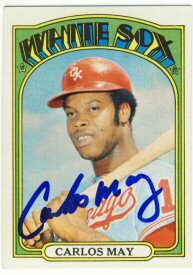 I received a 1972 Topps signed by Carlos May from an Under the Radar Sports private signing. 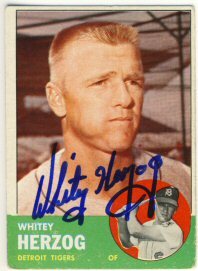 I also received a TTM 1963 Topps signed by Whitey Herzog who signed for his $10 fee. 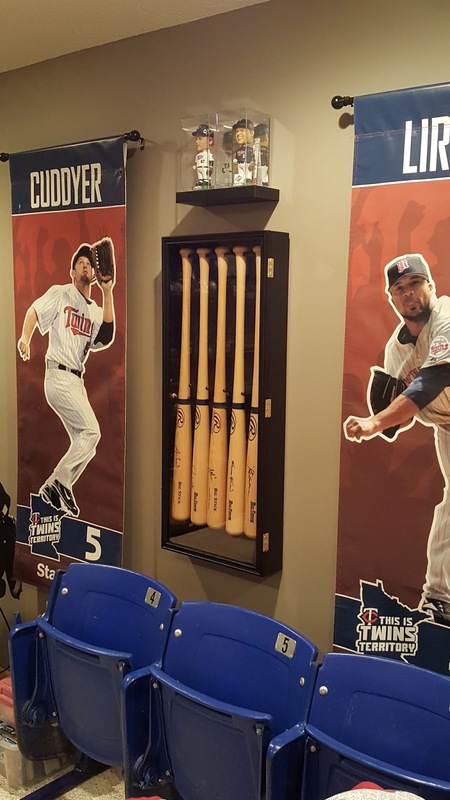 I'm about to give up on the other three requests I have out to the Twins spring training, but maybe I"ll be surprised later in the season. I'm anxious for the season to start, even though I have little hope that the Twins will have a decent season. 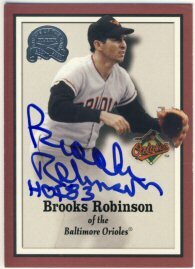 I noticed on sportscollectors.net that Brooks Robinson was signing from his home address for a small fee so I joined the crowd and sent him a 2000 Fleer Greats of the Game. 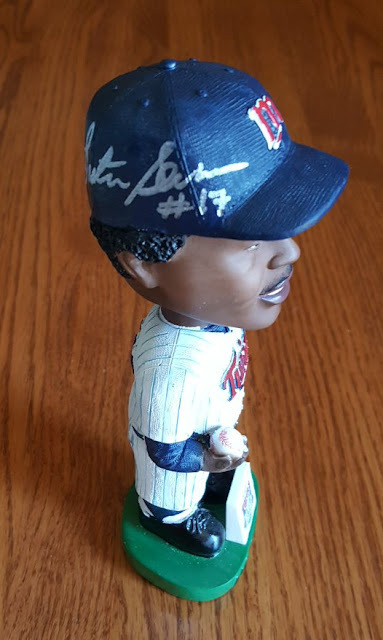 He signed it, added his HOF inscription and returned it in just 9 days for a $10 cash gift. 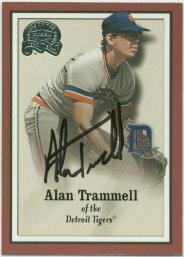 I've added a few cards to this set this the last couple of months and hope to add a few more, even though they weren't part of my goals for the year. Speaking of which, I'm not doing great on my goals, but I'll update them this weekend. 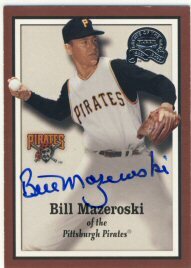 I sent in a couple cards to Tom Orr at Atommic Sports for a Bill Mazeroski signing and received them back today. 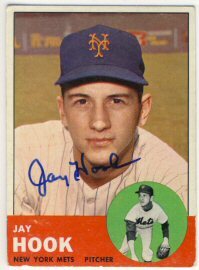 I had him sign a 1961 Topps and a 2000 Fleer Greats of the Game. 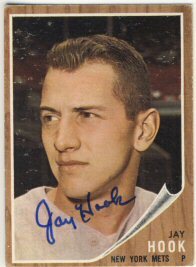 I sent out just a few requests in the last couple of weeks but hopefully those come back next week sometime. Okay, it's just three returns from my six requests, but I'm still happy to have gotten this far. 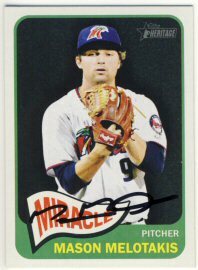 Mason Melotakis signed his 2014 Topps Heritage Minors card. 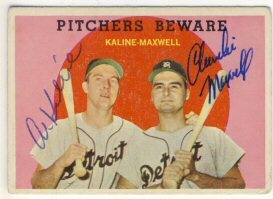 I received a return from Al Kaline today, who finished off the 1959 Topps Pitchers Beware card that Charlie Maxwell previously signed. 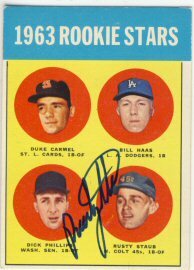 I love these vintage multi-signed cards! 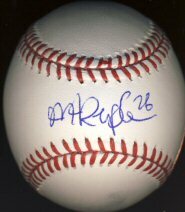 I received my second spring training return today. 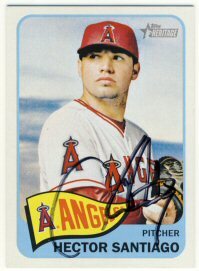 Hector Santiago signed his 2014 and 2015 Topps Heritage. 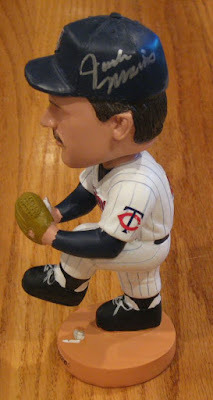 That makes two of the six requests I sent to Twins' spring training. 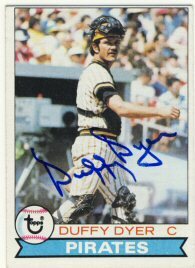 Yesterday I received a return from Duffy Dyer that I sent last November. 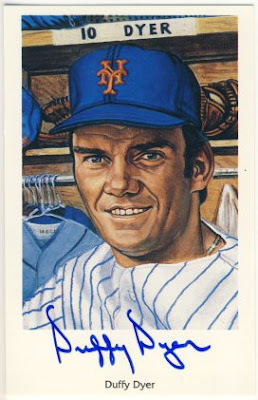 He was kind enough to sign his 1976 and 1979 Topps, as well as a 1969 Mets Ron Lewis postcard. 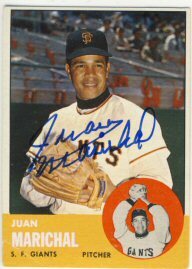 I really like these postcards. 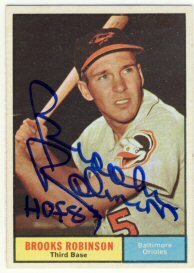 I think this is #14 from the set that I have signed.